Next week is pretty much a catch-up week for Japanese Wii and DSi owners, with only a couple of brand-new titles for DSi, neither one of which is a game. Bonsai Barber (800pts - Nintendo) – It's hard to believe this plant-barbering simulator hasn't already been available in Japan considering it was published by Nintendo in Europe and America many months ago, but by way of compensation Japan is getting it at a slightly discounted price. If you have yet to hang your plant trimming sign out, be sure to read our review and find out why you should already own this great game from Zoonami. Pilotwings (800pts Super Famicom - Nintendo) – Another game that's been out in other territories for months, this is Nintendo's classic flight sim for the Super Famicom. Flying fans will once again want to read our review to find out why we highly recommend checking this one out. Renjuku Kanji: Shoogaku 6 Nensei (500pts - I.E. Institute) – Sixth-grade kanji practice for the kiddies. Presumably there's only six more to go to complete the set! DS Kokoro Nurie (500pts - Nintendo) – This is a "colouring book" application which seems to have been produced with the support of a long-time practitioner of "Colour Therapy" (if we're understanding the "about" page translation properly). There are dozens of drawings and different pigments which can be combined and applied to them using virtual crayons, markers and brushes. This seems to be targeted at children and advertises the therapeutic effect colouring has on them - basically a lifestyle app for kids. It will be interesting to see if this shows up in other territories and how it is marketed if so. Exidia Zenki (800pts - Gameloft) – Gameloft's RPG comes to Japan. In our review we noted it was okay considering the lack of RPGs available on DSiWare, but unlike other territories Japan has a few to choose from in the DSi Shop, so it will be interesting to see how big a barrier to success the premium price point will be. Wow, took 'em a long time to get Bonsai Barber. Indeed, Tony. Bonsai for 800? Nice. woulda figured bonsai barber way sooner in japan than in america... but newho, its one of my favorite wiiware titles. ive had it since last april and i still keep finding new stuff. and btw... is it strange that firefox doesnt list the word japan (in lowercase, mind you) as a typo, yet america (in same case, mind you again) is? Wish I had imported a DSi LL for this. It gets expensive importing edutainment titles. Yes, everyone should have Bonsai Barber. Reminds me, it's been quite awhile since I last cut some veggie heads. Next time they send me a missive I'll have to open up shop! 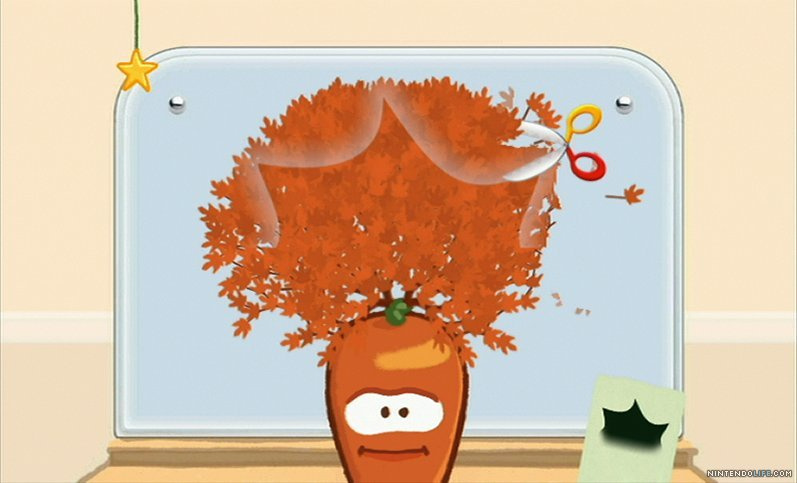 It's definitely the world's number one haircuts-for-vegetables game.